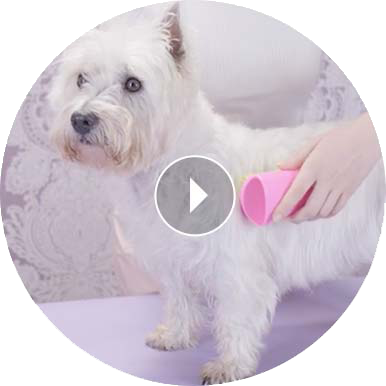 This palm friendly brush is ideal for de-shedding double-coated dogs, the ergonomic shape helps reduce wrist sprain during periods of brushing, making your life easier. Using patented two-tier teeth technology, the longer teeth gently remove dirt, reaching confidently down to the undercoat, the shorter teeth pick up loose hair. Polymer teeth makes the whole de-shedding experience kinder for your dog too as they reduce the risk of brush burn. Can be used on wet and dry hair. Some breeds of dogs – a Pomeranian, Shiba Inu and a Siberian Husky for example boast a double-coat of hair to keep lovely and warm. This is shed as the temperature rises or in a centrally heated home. A perfect all-round brush for superior de-shedding and de-matting, it’s super easy to clean. Simply lift the hair from the teeth and rinse with warm water. Allow to dry naturally with teeth facing up.